Here are three more of the past projects that I've stitched. I think all three of these were begun and finished in the 1993-1998 range. This next design is another from New Stitches, this one from issue #13. 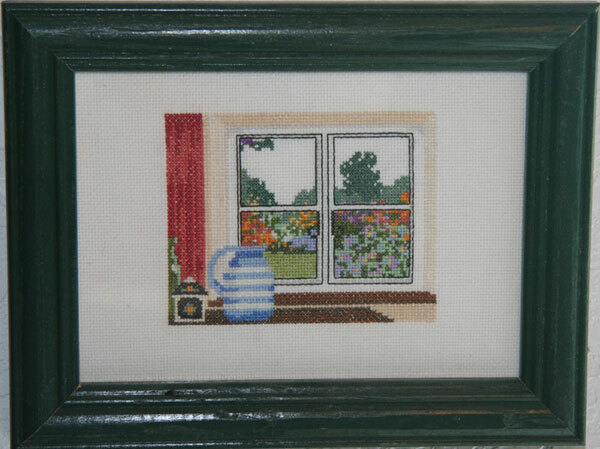 This is one of a pair of designs, where the other one is looking in to the house through the window. They've run several "in and out" designs over the years, but this is the only that I've stitched so far. This was also my first experiment stitching on a higher-count fabric. It's over 1 square on 22 ct. aida. I actually found that I liked working small and have done some more since, although several were given away as gifts and I never took pictures of them (bad me!). This is from a different British magazine, Needlecraft, in the July 1994 issue, and is one of my favorite things that I've stitched. I'm probably going to do it again on linen eventually (I have this weird desire to re-do a lot of my earlier projects on different fabrics and in different sizes... you'd think I would be more interested in doing new designs instead!) 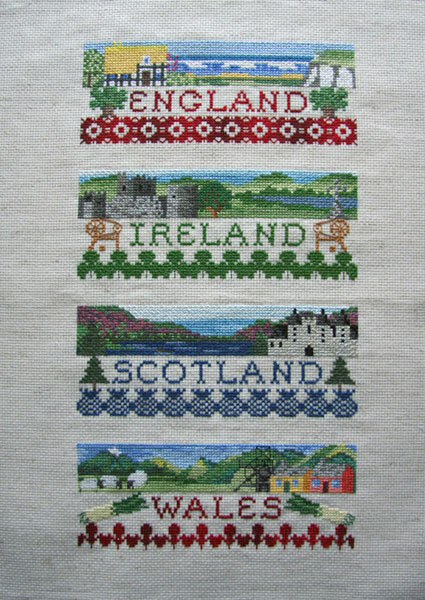 I think this was the first thing that I stitched with variegated floss (the symbols at the bottom of the "England" and "Wales" strips) and I really liked how it turned out. 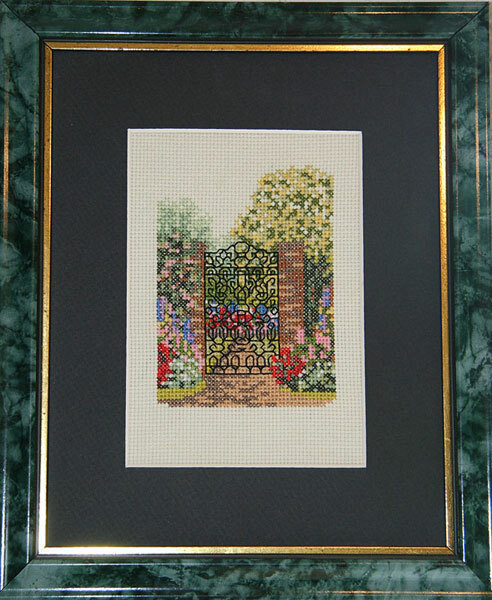 From roughly September 1994 to May 1995, I worked at Hobby Lobby to supplement the part-time job I was still working at the university (when I went full time at in June 1995) and of course worked in needlework and fabrics. This was the time that I caught the quilting bug (which will be its own series of posts eventually) but I also started learning about doing some new techniques. 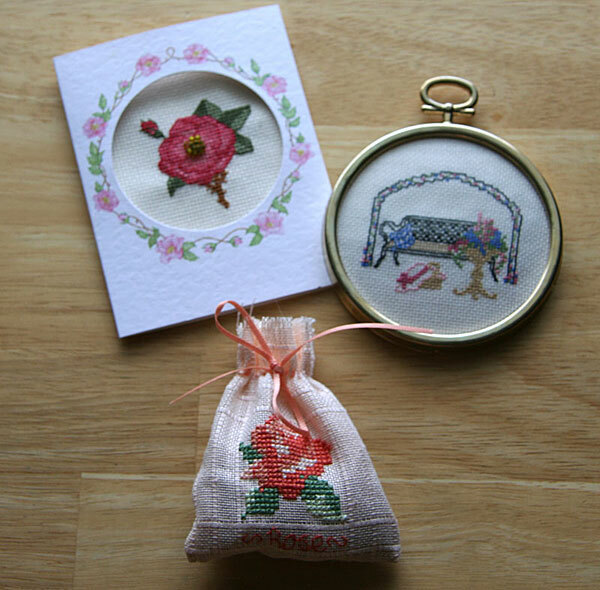 It was around this time that I got my first little linen project, the rose sachet in the picture above. I can't remember if this was a cover kit or something I bought separately (I think the latter), but the other two are cover kits from more British needlework magazines. The rose card was, I think, the first time I did beading on a design. That's more than enough for today!